Cosmonaut and Flight Engineer Elena Serova works in the Russian segment of the International Space Station. A trio of new Expedition 42 crew members is in its final preparations before Sunday’s launch and six-hour ride aboard a Soyuz TMA-15M spacecraft to the International Space Station. The rocket with the Soyuz capsule attached will roll out to the launch pad Friday morning at the Baikonur Cosmodrome in Kazakhstan. 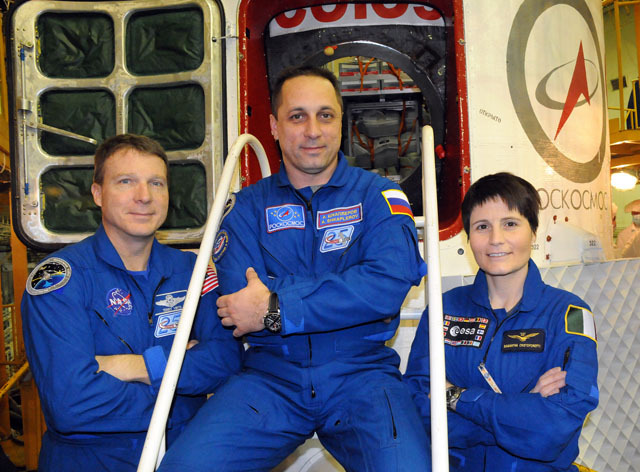 Aboard the orbital laboratory, the current crew members, Commander Barry Wilmore and Flight Engineers Alexander Samokutyaev and Elena Serova, are working their scheduled task list of ongoing science and maintenance. Wilmore opened the Fluids Integrated Rack to configure a microscope for the ACE-M-3 experiment. The advanced fluids study observes small particles suspended within a liquid that build into 3D structures. During the afternoon, the commander worked on Europe’s Kubik incubator that supports life science with organisms such as seeds, cells and small animals. The orbiting cosmonauts got back together again Thursday working on a Russian chemistry education experiment with Russian school children. The duo also worked throughout the Russian segment checking cables, inspecting panels and conducting preventative maintenance on the ventilation system and oxygen generator. jsc2014e093604 (Nov. 19, 2014) — In the Integration Facility at the Baikonur Cosmodrome in Kazakhstan, Expedition 42/43 crewmembers Terry Virts of NASA (left), Anton Shkaplerov of the Russian Federal Space Agency (Roscosmos, center) and Samantha Cristoforetti of the European Space Agency (right) pose for pictures Nov. 19 in front of their Soyuz TMA-15M spacecraft. Credit: NASA/Viktor Ivanov. Commander Barry Wilmore worked in the Japanese Kibo lab module on the Aniso Tubule botany experiment that studies how roots adapt to gravity. 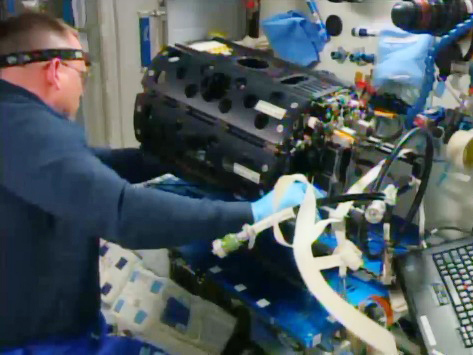 After lunch, Wilmore went back to more hardware replacement work on the Combustion Integrated Rack that he began Tuesday. At the end of the day he configured a maintenance work area for upcoming operations of another botany study, the Seedling Growth experiment. Flight Engineer Alexander Samokutyaev worked in the Russian segment venting gas from an air conditioner. He was assisted by his fellow cosmonaut Elena Serova who also installed gas analyzer hardware and cleaned vents. The duo partnered up later in the day for a new chemistry education experiment with participation from Russian school children. The next Expedition 42 trio waiting to join the International Space Station crew conducted final Sokol launch and entry suit fit checks at the Baikonur Cosmodrome in Kazakhstan. NASA astronaut Terry Virts, Roscosmos cosmonaut Anton Shkaplerov and European Space Agency astronaut Samantha Cristoforetti are making final preparations before Sunday’s launch at 4:01 p.m. EST to the space station aboard the Soyuz TMA-15M spacecraft. Commander Barry Wilmore worked throughout the day Tuesday in the Destiny laboratory’s Combustion Integrated Rack replacing hardware that fuels experiments. Afterward, he drained a waste water tank in the Tranquility node then moved on to a Health Maintenance System test. Flight Engineer Alexander Samokutyaev replaced a battery module in the Zvezda service module then repaired and photographed an air duct. 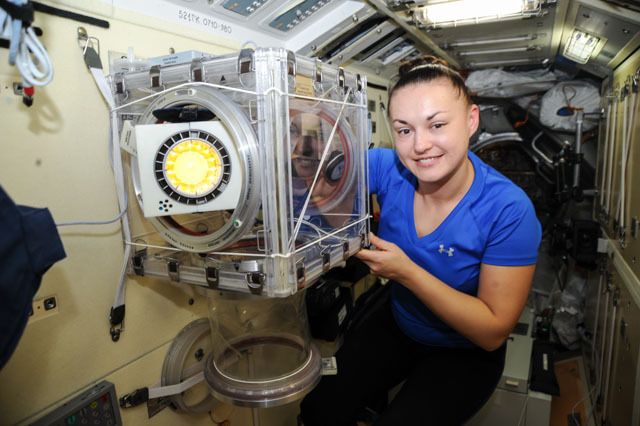 His fellow cosmonaut, Elena Serova, checked Russian sensors that monitor air pressure then proceeded with disinfectant work to prevent microbial growth in the Zarya module. A new trio of Expedition 42 crew members is relaxing at the Cosmonaut Hotel crew quarters in Kazakhstan. Soyuz Commander Anton Shkaplerov and Flight Engineers Terry Virts and Samantha Cristoforetti played games, had medical checks and planted trees during a traditional ceremony Tuesday. Their Soyuz TMA-15M spacecraft is being readied for its roll out to the launch pad at the Baikonur Cosmodrome on Friday. The new crew will launch aboard the Soyuz on Sunday for a near six-hour ride to the International Space Station’s Rassvet module. 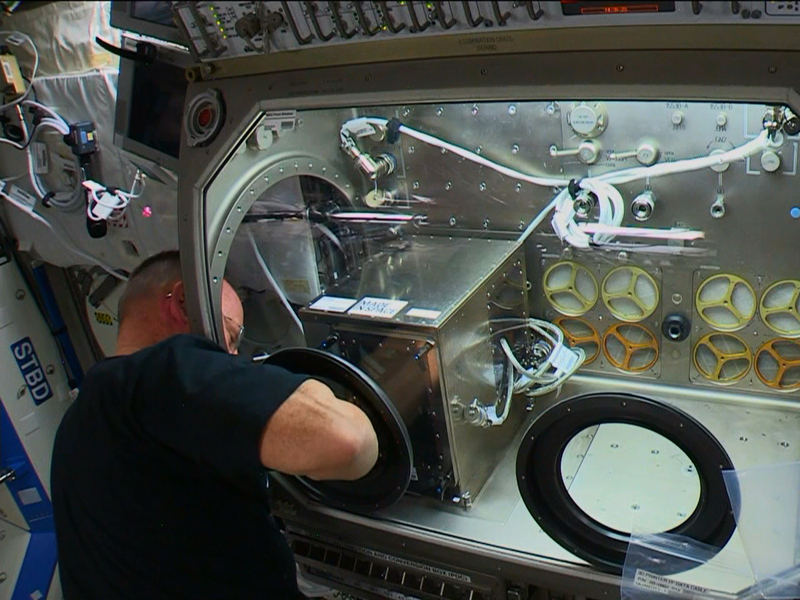 Commander Barry Wilmore worked throughout Monday to install a 3D printer to get the International Space Station and future crews ready for self-sufficiency. Wilmore will work to calibrate the printer and set up a demonstration of the additive manufacturing technology. His fellow crew members, Flight Engineers Alexander Samokutyaev and Elena Serova, worked on routine maintenance tasks and cargo transfers in the station’s Russian segment. They also paired up for a cardiovascular exam on an exercise bike, sampled the station’s atmosphere and tested television downlink signals. The next trio to join Expedition 42 is in Kazakhstan counting down to a Nov. 23 launch aboard a Soyuz TMA-15M spacecraft. 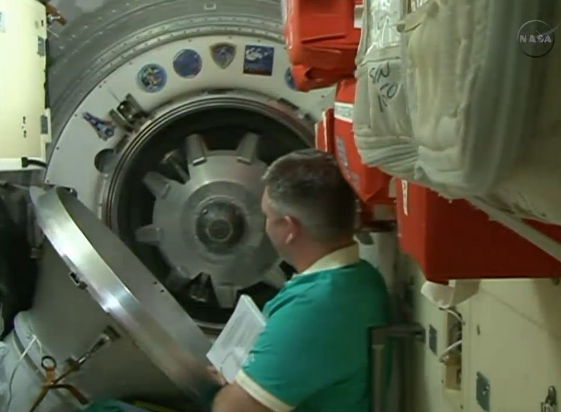 They are set for a near six-hour ride to the International Space Station where they will live and work until May 2015. 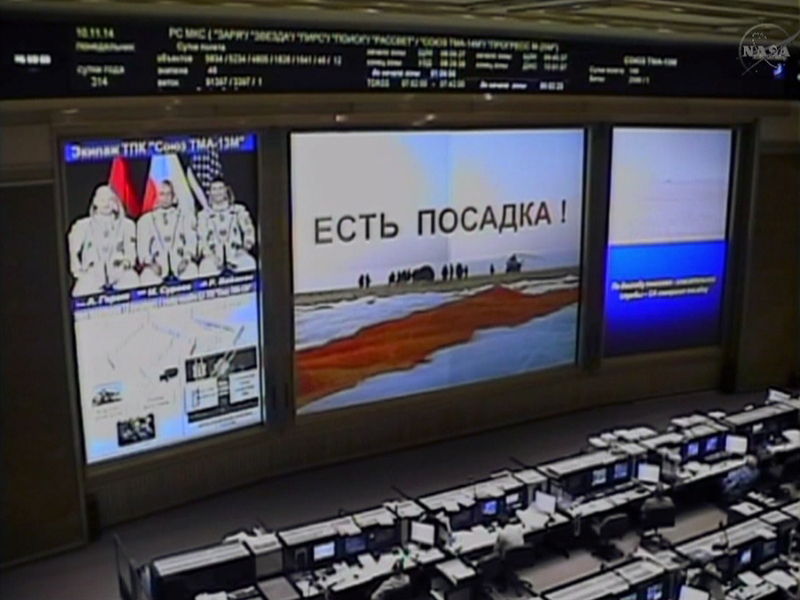 The Soyuz TMA-13M carrying the Expedition 41 trio fires its soft-landing engines right on time at 10:58 p.m. EST. Expedition 41 Flight Engineers Reid Wiseman of NASA, Alexander Gerst of the European Space Agency and Commander Maxim Suraev of the Russian Federal Space Agency (Roscosmos) landed their Soyuz TMA-13M spacecraft in Kazakhstan at 10:58 p.m. EST. The trio arrived at the International Space Station on May 29, and spent more than five months conducting research and maintenance activites. 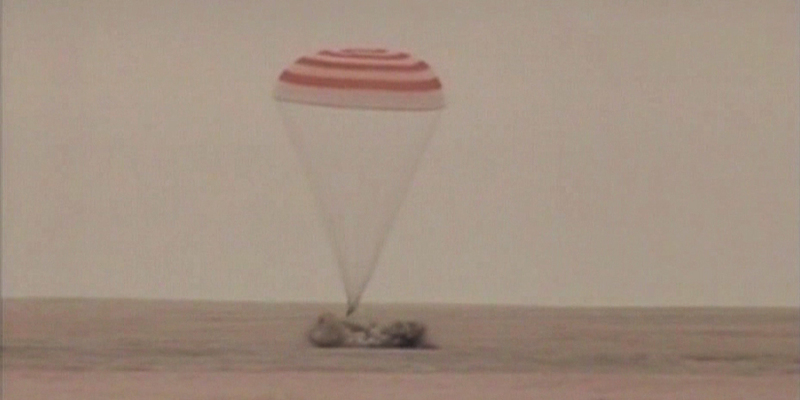 Russian recovery teams will help the crew exit the Soyuz vehicle and adjust to gravity after their stay in space. Wiseman, Gerst and Suraev spent 165 days aboard the space station and clocked more than 70 million miles during their time in space. This was the first mission for both Wiseman and Gerst. 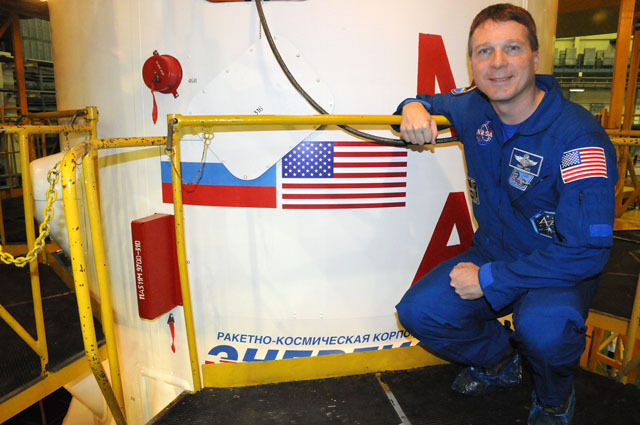 Suraev now has spent 334 days in space during two missions, including Expeditions 21 and 22. The station now is occupied by Expedition 42 Commander Barry “Butch” Wilmore of NASA and Flight Engineers Alexander Samokutyaev and Elena Serova of Roscosmos. They will remain aboard the station to continue research and maintenance until the remainder of the Expedition 42 crew arrives later this month. NASA astronaut Terry Virts, Russian cosmonaut Anton Shkaplerov and ESA astronaut Samantha Cristoforetti are scheduled to launch from Baikonur, Kazakhstan, Nov. 23, (U.S. time). Expedition 41 crew members Reid Wiseman of NASA, Alexander Gerst of the European Space Agency and Soyuz Commander Maxim Suraev of the Russian Federal Space Agency (Roscosmos), are headed back to Earth following the 4-minute, 41-second Soyuz TMA-13M deorbit burn completed at 10:09 p.m. EST. The three sections of the Soyuz spacecraft will pyrotechnically separate at 10:32 p.m., atmospheric entry interface occurs at 10:35 p.m., parachutes will open at 10:44 p.m. and landing is targeted for 10:58 p.m. northeast of Arkalyk, Kazakhstan. NASA will continue broadcasting on all its television channels and online at https://www.nasa.gov/nasatv until the crew members are safely removed from the Soyuz. After spending 165 days aboard the International Space Station, Reid Wiseman, Alexander Gerst and Maxim Suraev undocked from the station’s Rassvet module at 7:31 p.m. EST to begin their voyage home. Suraev, the Soyuz commander, is at the controls of the Soyuz TMA-13M spacecraft. They will perform a separation burn to increase the distance from the station before executing a 4-minute, 41-second deorbit burn at 10:05 p.m. The crew is scheduled to land at 10:58 p.m. northeast of Arkalyk, Kazakhstan. The departure of Wiseman, Gerst and Suraev marks the end of Expedition 41. The Expedition 42 crew members, Commander Barry “Butch” Wilmore of NASA and Alexander Samokutyaev and Elena Serova of the Russian Federal Space Agency (Roscosmos) will continue research and maintenance aboard the station. NASA Television will air live coverage of the Soyuz TMA-13M deorbit burn and landing beginning at 9:45 p.m. Here is the timeline for the Expedition 41 landing. 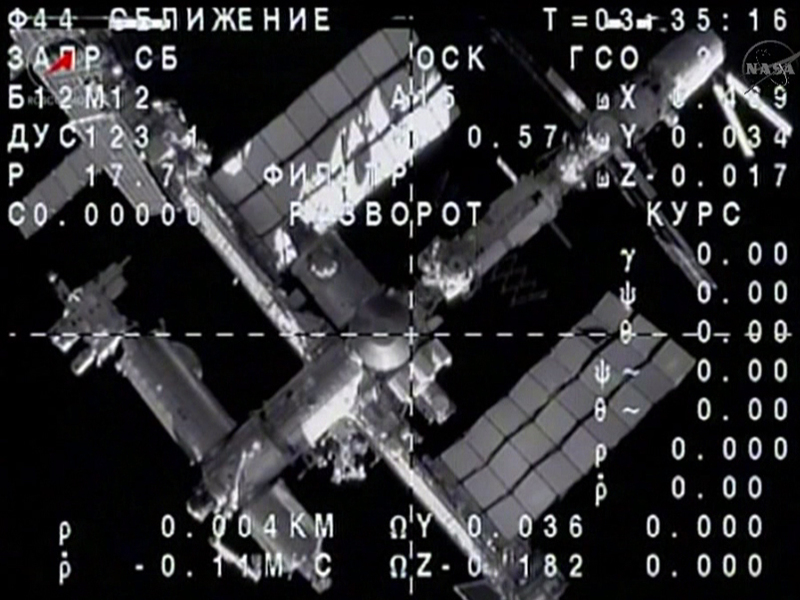 At 4:27 p.m. EST, hatches closed between the International Space Station and Soyuz TMA-13M. Expedition 41 crew members Reid Wiseman, Alexander Gerst and Soyuz Commander Maxim Suraev are preparing to undock at 7:31 p.m. NASA Television will air live coverage of undocking beginning at 7:15 p.m. The deorbit burn is targeted for 10:05 p.m. and will lead to a landing at 10:58 p.m. northeast of Arkalyk in Kazakhstan. NASA TV coverage of deorbit and landing begins at 9:45 p.m. Watch live at https://www.nasa.gov/nasatv. 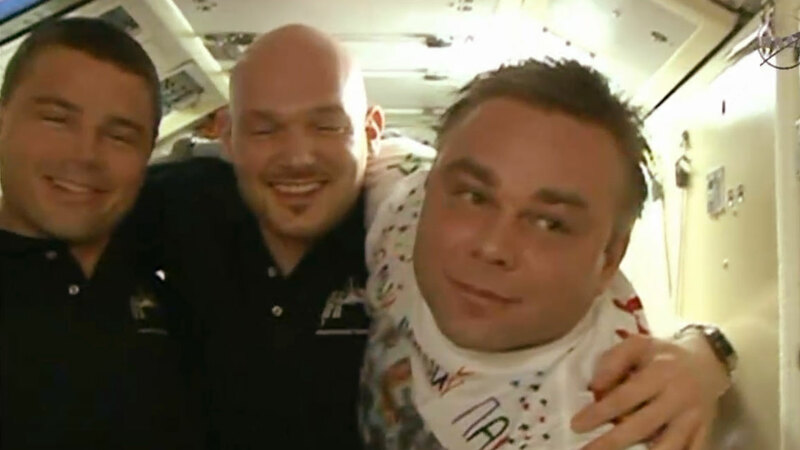 (From left) Reid Wiseman, Alexander Gerst and Max Suraev say goodbye before entering their Soyuz TMA-13M spacecraft. Credit: NASA TV. 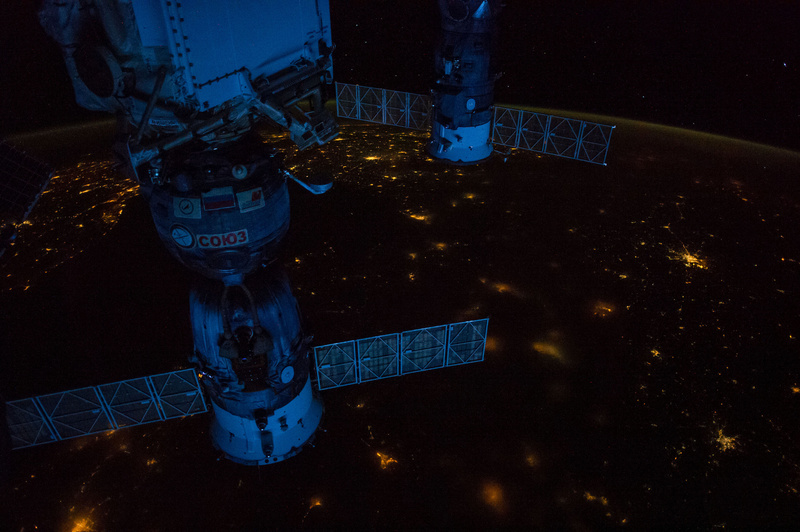 Night time view of the docked Soyuz TMA-13M spacecraft. 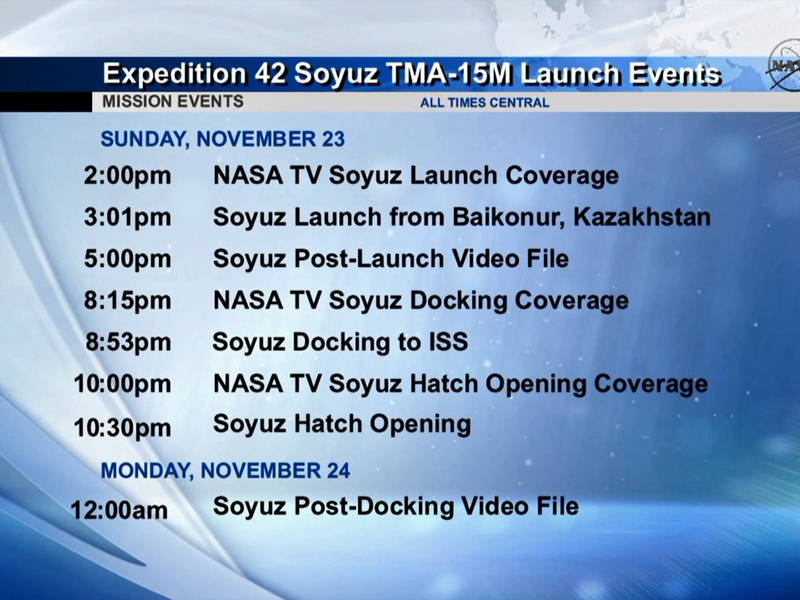 Here is a timeline of the Expedition 41 undocking and landing. 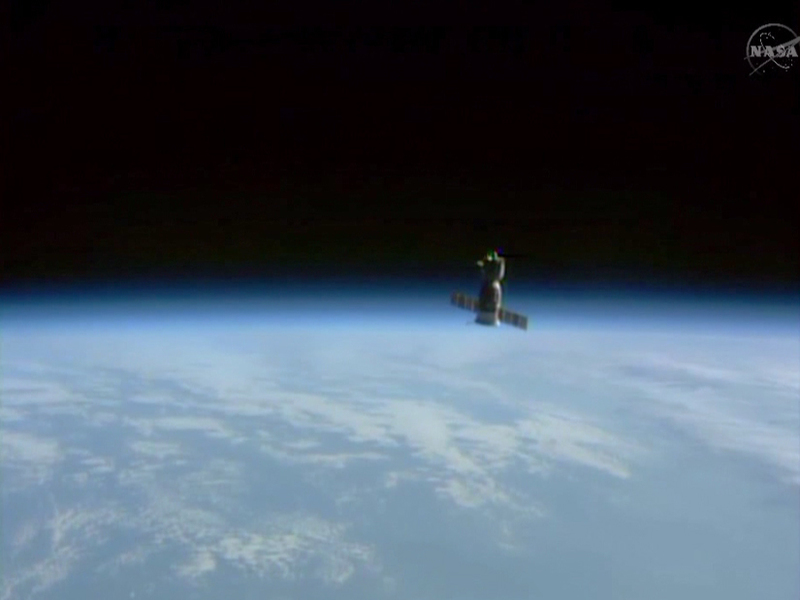 10:58 p.m. Expedition 41 Soyuz TMA-13M landing northeast of Arkalyk, Kazakhstan. Join the conversation on Twitter by following hashtags and . To learn more about all the ways to connect and collaborate with NASA, visit: https://www.nasa.gov/connect. 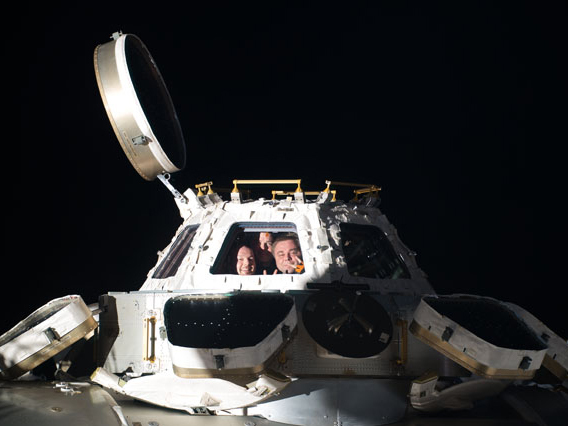 (From left) Expedition 40/41 crew members Alexander Gerst, Reid Wiseman and Max Suraev peer out of the cupola. The homebound Expedition 40/41 trio of Soyuz Commander Max Suraev and Flight Engineers Reid Wiseman and Alexander Gerst spent Thursday morning reviewing their Soyuz undocking and descent activities ahead of their Nov. 9 landing in Kazakhstan. Their orbiting Expedition 41/42 crewmates Flight Engineers Barry Wilmore, Alexander Samokutyaev and Elena Serova practiced emergency communication and coordination tasks. The crew also had time set aside for a variety of medical and physical science. Gerst conducted Ultrasound eye scans on Wilmore. Reid strapped on sensors and exercised for the Sprint study. Serova collected data for the Matryeshka radiation detection experiment. Suraev and Samokutyaev worked on cargo transfers and Soyuz preparations. Expedition 42/43 crew members Terry Virts, Samantha Cristoforetti and Anton Shkaplerov are due to liftoff Nov. 23 aboard a Soyuz TMA-15M spacecraft for a six hour ride to their new home in space. They were in Star City, Russia, for a news conference before going to Moscow for traditional pre-launch ceremonies.